When the term doubled die is used, we are commonly referring to a coin which has a doubled or partially doubled image, letters, and/or numbers. However, a doubled die is actually a die which exhibits this doubling, and any coin struck from this die will exhibit this doubling. The correct terminology for the resulting products of doubled dies would be doubled die coins. So that we may understand how the doubling occurs on the dies themselves, we must first take a look at the hubbing process; the production of the dies. Once the coin design has been approved, it is then modeled on plaster in relief (positive), just as it will appear on the coin. The next step is to coat the plaster with epoxy resins to create a surface hard enough to withstand the next process. This epoxy coated model is called a galvano. The galvano is usually 12 to 15 inches in diameter. The next step is to reduce the design on the galvano to the actual size of the coin to be produced. To accomplish this, the Mint uses a Janvier Transfer Reducing Machine. 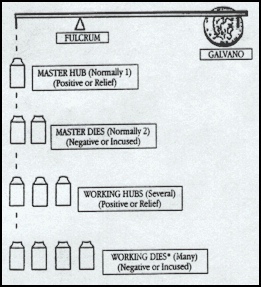 This machine, operating on the principle of a fulcrum, will trace the design on the galvano. This is accomplished by a long metal arm with a tracing stylus on one end as the galvano rotates. The tracing will be transferred to the opposite end, where a sharp cutting tool is positioned. This cutting tool will be carving the design exactly as it is traced from the galvano onto the end of a steel bar. This steel bar will usually be about 2 inches in diameter, and tapered so that the end being cut will be the actual size of the coin to be produced. The steel bar will also be rotating, however at a slower speed, so that the design being traced from the galvano will be properly transferred. The process will usually be duplicated at least once to ensure proper sharpness of the design. Once complete, the steel bar will become what is known as the master hub (sometimes called "hob"), with the design again in relief, as it will appear on the finished coin. The master hub is then placed into a hydraulic press, known as a hubbing press, opposite another blank steel bar. These steel bars, usually about 6 inches long, are hardened steel. Several hundred tons of force will be applied as the master hub and the raw steel bar are brought together. This process will "squeeze" the design on the master hub into the steel bar. After one impression, the new steel bar will be taken to an annealing furnace, where it will be heated to extreme temperatures to soften the steel for the next impression. When cool, the new steel bar will again be impressed with the master hub. This process, known as hubbing, must be performed at least twice to bring the design up to the desired sharpness. Once the desired sharpness of detail is achieved, a master die will have been created, with the design incused (mirror image). Depending upon the design and denomination, the hubbing process may need to be repeated as many as 15 times. This is the first point at which doubled die can occur. There is generally one master hub produced, and possibly two master dies. The master die will create a working hub, again in the same manner as described above (hubbing), and with the design in relief as it will appear on the coin. Working hubs are used to create working dies, with the design incused (mirror image). Generally, several working hubs will be produced, and hundreds of working dies. Doubled dies can occur during any of the above mentioned hubbing operations if the die and hub are not properly aligned. There are currently eight different types or classes of doubled dies listed. These different classes are described and named based upon the method in which the particular doubled die occurred. It is important to use the correct terminology. "Double die" would represent two dies, and as you know, we are dealing with a single die, with a final product which has a doubled (past tense) image, so therefore, doubled die is the correct term. It is also important to note that in the descriptions that follow, we often refer to the hub entering the die when explaining how the various classes of doubled dies occur. We chose this explanation for simplicity, but keep in mind that doubled die doubling can occur when the master hub is impressing the master die, when the master die is impressing the working hub, and when the working hub is impressing the working die, or a combination of any of these. We are referring to doubled dies in this text, but you should keep in mind that we are also taking about any die with a multiple image. Tripled and quadrupled dies are known to exist, and they are in this same family of die varieties. One final note; keep in mind that the different classes of doubled dies are numbered and identified with Roman numerals, and not Arabic numbers. This class occurs when the hub, after the initial impression into the die, is rotated slightly either clockwise or counter-clockwise around an axis in the center of the coin design prior to being re-entered into the die. The images around the rim will be of equal spread, and the spread at the rim will be greater than that nearer the center of the coin. The most well known class I doubled die is the 1955 Lincoln Cent doubled die obverse. This class occurs when a die is used for one hubbing, and a die with a distorted hub used for a subsequent hubbing, creating an image overlapping, and spread irregularly toward the rim. The process could also create a die which was hubbed initially with a distorted hub, then subsequently with a fresh hub, creating a spread in the opposite directing. The spread will be defined either toward the rim or toward the center of the coin. This class is caused when a die is hubbed with a hub of one design, and a second hubbing with a hub with a different design, or the same design but with slightly different positioning. The 1943/2-P Jefferson nickel is a good example. This form of doubling is caused when one impression of the hub into the die is offset in one direction from the other. A well known example is the 1983 Lincoln cent doubled die reverse. This form of doubling is caused when the die after its initial impression is mis-aligned with the hub a second time in a fan shape direction. The pivot point will usually be near the rim, and the doubling will be strongest opposite the pivot point. A good example of this doubling is the 1917 Lincoln cent doubled die obverse. This form of doubled die is the most difficult for many novices to identify, as it will rarely exhibit any separation of the two images. A die may be hubbed with greater than normal pressure, then hubbed again with normal pressure, but with the design in a slightly different position. This will create a single image, but with thicker than normal letters and numbers, with little or no trace of doubling. A hub that was modified or changed so that all or part of the design element was left on the hub in or around the same or a different design element, so that all or part of both design elements were transferred to every die made with that hub, and all or part of both appear on the struck coin. A die that was hubbed normally the first time, but the hub or die was tilted for a subsequent impression so that the hub either made partial contact with the die at one point, or a full impression that was deeper at one edge than at the other. This will show on the struck coin as a displaced part of the design or a tapering amount of relief across the face of the coin. The descriptions above describe the various classes of doubled dies. However, it is possible to have a doubled die coin exhibit two or more different classes. A good example is the 1971-S proof Lincoln cent listed as 2-O-II+V. This variety exhibits both the class II and class V doubling, as the secondary image is slightly toward the center of the coin, and also pivoted. The pivoting explains why the doubling is evident on LIBERTY, but not on the date. Descriptions taken in part from Alan Herbert's book Official Price Guide to Minting Varieties and Errors. Alan is the catalyst behind most of out current knowledge of Mint errors and varieties. Copyright 2000 by J. T. Stanton.